Tonight’s the second-last busy night of the NHL regular season with 12 games on the board. And even though there’s only 1 playoff spot still up for grabs in each conference and the 8th spot in the West will essentially be decided Saturday when the Blues visit the Avalanche, there’s still a lot riding on most of tonight’s contests. The Bruins can pull ahead of Tampa in the Atlantic with a win tonight, the Penguins, Blue Jackets and Devils are battling for home-ice advantage in the first round, and the Sharks, Kings and Ducks are doing the same in the West. We finally enjoyed a winning night again on Tuesday as the Canadiens showed some pride in their final home game of the year, coming from behind to extend a tired Jets team with a thin lineup and backup goalie into overtime and covering the +0.5 regulation time wager. Leans also went 5-2 Tuesday and are now 20-10 over the last 10 days, suggesting that our March struggles may be behind us. We’re hoping a strong run in the final few days of the regular season will get us back to the +20 unit mark on the season, which was actually our personal goal at the start of the campaign. We’ve got 5 bets tonight and have opinions on most of the other games as well. Good luck on whatever you play! Reasons to bet Carolina: The Hurricanes have allowed just 13 goals in their last 6 games. Philadelphia has allowed 3+ goals in 7 of its last 8. Reasons to bet Philadelphia: The Flyers are 5-1-3 in their last 9 games and are still battling for a playoff spot. Carolina has lost 14 of its last 22 games. Reasons to bet Boston: The Bruins are 22-11-7 on the road and playing for first place in the Atlantic Division. Florida has lost 6 of the last 7 meetings, including a 5-1 rout by the Bruins Saturday in Boston. Reasons to bet Florida: The Panthers basically need to win out as they chase a playoff spot in the East. Boston has lost its last 3 road games and 4 of its last 6 away from home. Reasons to bet Vegas: The Golden Knights are 6-1-2 in their last 9 games. Edmonton has lost 5 straight and scored just 6 goals in its last 4. Reasons to bet Edmonton: The Oilers have won 2 of their 3 meetings with Vegas this season. Reasons to bet Arizona: The Coyotes have won 4 of their last 5 games and are 17-8-2 in their last 27. Vancouver is just 15-18-7 at home. Reasons to bet Vancouver: The Canucks are 5-1-1 in their last 7 games and will be motivated to deliver a victory in the final home game of Henrik and Daniel Sedin’s careers. Arizona has lost 8 of its last 11 trips to Vancouver. Reasons to bet Minnesota: The Wild has allowed 17 regulation time goals in its last 10 games, excluding empty netters. Minnesota is 5-1-3 in its last 9 games versus the Kings. Reasons to bet Los Angeles: The Kings can still improve their playoff positioning with a win while the Wild is locked into third in the Central. LA has allowed just 4 regulation time goals in its last 4 games and 2 or less in 6 of its last 7. Reasons to bet Nashville: The Predators should be motivated to clinch the Central Division with a victory as well as break out of a 3-4-1 funk in their last 8. Washington has lost 6 of the last 8 meetings. Reasons to bet Washington: The Capitals have won 7 of their last 8 games and are 27-10-2 at home. Nashville is playing its 4th game in 6 days and 8th in 13. Reasons to bet NY Rangers: The Rangers have won 6 of their last 7 games against opponents with losing records. The Islanders have allowed 3+ goals in 7 straight games and 9 of 10. Reasons to bet NY Islanders: The Islanders have owned their cross-town rivals for years, winning the last 6 meetings and 13 of the last 16. The Rangers have lost 7 of 9, allowing 4+ goals in 6 of those outings. 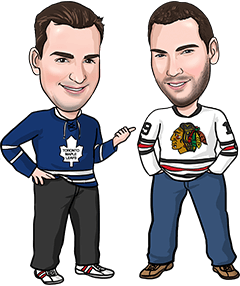 Reasons to bet Toronto: The Leafs have won 9 of their last 12 games and scored 4+ goals in each of their last 11 victories. Reasons to bet New Jersey: The Devils are 6-0-1 in their last 7 games and could clinch a playoff spot with a win tonight in their home finale. Toronto has nothing to play for in the standings. Reasons to bet Pittsburgh: The Penguins have had 3 days off to prepare for this clash that could determine home-ice advantage in the first round of the playoffs. Columbus has allowed 8 regulation time goals in its last 2 games. Reasons to bet Columbus: The Blue Jackets are 8-1-1 in their last 10 games and have won 16 of their last 21. Pittsburgh has 1 regulation time win in its last 6 games and is just 16-20-4 on the road. Reasons to bet Montreal: The Canadiens have scored 3+ goals in 5 of their last 7 games. Detroit has lost 7 of the last 9 meetings. Reasons to bet Detroit: The Red Wings are 3-0-1 in their last 4 games, including an OT loss Tuesday to the red-hot Blue Jackets. Montreal has lost 16 of its last 21 road games and is coming off a draining 5-4 OT loss to WInnipeg Tuesday in its final home game of the year. Reasons to bet Calgary: The Flames are 20-14-6 on the road. Winnipeg is playing its first home game following a 4-game road trip and has gone to OT in 5 of its last 8. Reasons to bet Winnipeg: The Jets have won 9 of their last 10 games overall and are 30-7-2 at home. Calgary has been outscored 39-12 in its last 9 games, winning just once during that span. Reasons to bet Colorado: The Avalanche is desperate for points as it fights with St. Louis for the final wild card spot in the West. San Jose has lost 4 straight. Reasons to bet San Jose: The Sharks are still playing for home-ice advantage in the first round. The late-season pressure might be getting to the young Avalanche, which has scored 1 regulation time goal in 5 of its last 7.